The Hallmark Flowers Happy Hearts Red Anthurium features heart-shaped glossy leaves with heart-shaped red blooms, brightens spirits and adds elegance and color to home or office decor. This 14-18-inch tall, 5-inch wide red anthodium ships 100-percent in bloom with beautiful flowers for months of lasting enjoyment. Happy Hearts Anthurium arrives already placed in a 5-inch orange-colored ceramic container to enhance decor wherever it goes. To care for Happy Hearts, water thoroughly with cool water once a week and drain. Allow drying out slightly between watering's and be careful not to overwater. Place in bright, indirect sunlight at 65-85 degrees F. New shoots will grow continuously for several months. Hallmark Flowers ship in a decorative Hallmark gift box with advanced packaging technology to protect the plant throughout shipping. Happy Hearts Anthurium with its heart-shaped blooms is a wonderful gift for any occasion and especially appropriate for Valentine's Day, birthdays, house warmings, and condolences. - Happy Hearts Anthurium with its heart-shaped blooms is a wonderful gift for any occasion and especially for Valentine's Day, birthdays, house warmings, and condolences. - Enjoy beautiful red flowers when the anthurium arrives and watch it bloom for months to come with proper care. - Happy Hearts Anthurium is 14-18-inch tall, 5-inch wide and ships 100-percent in bloom. 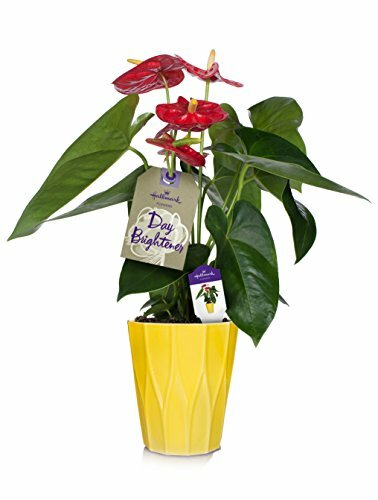 - Happy Hearts Anthurium arrives already in a 5-inch yellow-colored ceramic container.